Meta tags forms a base structure for ranking the Shopify store products, collection, categories and subcategory pages. They are a vital component for SEO – specifically optimizing each page with its On-Page components. Navigate to Products or Collections for adding SEO Meta tags..
You can follow same process to add Meta details for all pages, collections, categories or subcategories in your Shopify Store. Add all the required verification tags for all pages in your Shopify store. 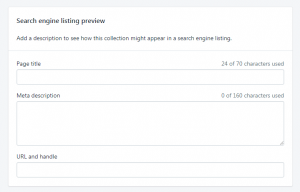 These tags will be same across all the pages – product pages, collection pages, and category and sub-category pages. Add these tags between <head> and </head>. Add the following tags as required and replace “XXXXX” part with your unique key shared by each of these Platforms. These verification tags are necessary to get started with SEO and verifying your Shopify store with Google Search Console, Bing WebMaster, Yandex Webmaster or Pinterest.